Can social media be useful for politics? Clay Shirky explored this question last night at the London School of Economics in a lecture chaired by Charlie Beckett. 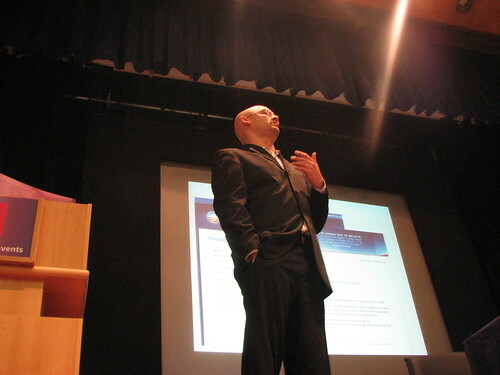 Shirky has been a proponent of the transformative power of social media for a long time. His book is a chronicle of how this new way of communicating is changing social and commercial realities. But tonight Shirky raised some fundamental questions about the interface of social media with politics. We’ve got serious issues of legitmacy and balance to solve. Shirky’s thesis is that social media have essentially removed the old barriers to group organization: information scarcity and organization cost. When information is scarce or unavailable it is difficult to move a group to action, or make that action effective. Also, organizing groups is very difficult and costly in time and resources. Or at least, it used to be. Now, with social media, information is abundant and groups can be organized and motivated at little or no cost. Shirky told the story of students organizing against HSBC to illustrate this. Short version: bank offers students free overdraft services. Students flock to it. Bank waits until summer, then changes its mind and slaps on lots of fees. Students revolt, organize via Facebook, start a major PR stink, and the bank backs down. This is “organization instantiated into a platform,” in Shirky’s words. Shirky gave two other examples. The first was the Sichuan earthquake of May 2008, in whose aftermath Twitter and other social media platforms completely changed the politics of information in China. And of course there is the presidency. In the last year, we’ve all seen the implementation of social media in a direct political context with Barack Obama’s presidential campaign. Obama was a “platform candidate” according to Shirky. His team set up a social network and encouraged people to use their own words to get the message out. Shirky maintains that in order to benefit from the power of a decentralized network, you must surrender control. But there’s the risk: what if individuals in the network do something that actually damages you? In the actual case, the benefit from Yes We Can far outweighed the harm from Sing For Change. Social media is not like mass media, where central broadcasters or printers are responsible for everything on their paltform. Shirky says that the US public has gotten sophisticated enough to know that just because something has your name on it, doesn’t mean you’re responsable. Anyone can put something on YouTube. According to Shirky the question now is becoming one of legitimacy. In a social media context, anyone can start a group or motivate a movement. But in a democratic society, the legitimacy of those movements can only come from the basic principle of franchise: one person, one vote. It’s not always clear that these groups have such legitimacy. At the moment, there’s no principle for determining how seriously to take any particular group organizing through social media. When Obama was elected his team immediately switched on change.gov. The centerpiece of this site was a forum where anyone could propose an issue that the president should tackle on his first day in office. Other site visitors could then vote the issues up or down. The idea was that the people’s collective will would float the best ideas to the top. In the midst of a vast economic crisis, two wars, and an imploding health care system, the most important issue for the president was judged to be legalizing medical marijuana. After talking about openness and the power of the network, the president’s administration was forced to quietly ignore that one. Shirky actually said that the answer here may be in the cost of communication. If it costs more to send a signal, then the signals that are sent are more authentic. This certainly rings true in the medical marijuana case. Could it be that social media make it a little too easy?